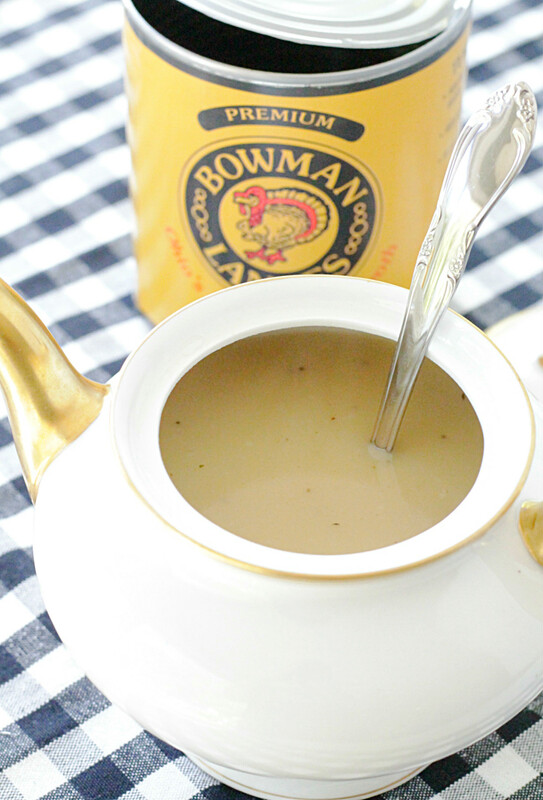 This homemade turkey gravy recipe explains how to make fool-proof gravy from either roasted turkey drippings or canned broth. In my family gravy is basically its own side dish rather than a condiment. Can anyone relate? At Thanksgiving I need to be sure and have extra gravy for my Aunt especially. And it’s really not just her – we all love turkey gravy – it’s just she’s the one that has been making the joke about never having enough gravy the longest. 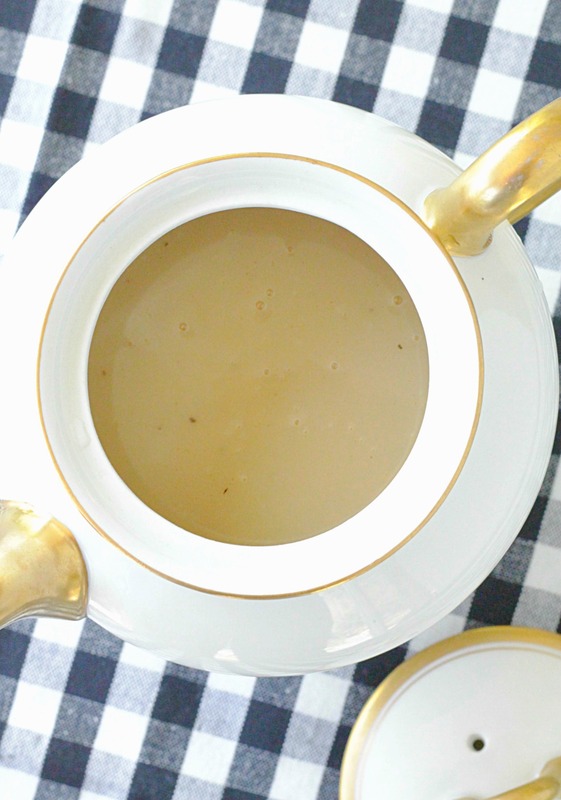 So I figured it was time to share my Homemade Turkey Gravy Recipe with you. One thing in particular I’ve noticed in other recipes for turkey gravy is that the instructions tell you to put the turkey roasting pan directly on the oven burners. I’ve personally never done that. First of all, when I roast a whole turkey my pan is huge and even across two burners would not fit well on top of my stove. Plus depending on if you have gas or electric burners, or a flat top stove, it just might not make for a level cooking surface and therefore be unsafe. So I always make my gravy in a clean pan. I pour my drippings from roasting a whole turkey (or turkey breast) into a fat separator so that I’m adding all the flavor from the roasted turkey but not all the fat to my gravy. I make a roux with butter and flour and then I always add canned broth to make sure I have at least four cups of liquid to make my gravy. I’m lucky to be able to find canned – and local – turkey broth at my grocery store. If you can’t find turkey broth, chicken broth is fine. I’ve found that about 5 tablespoons of flour for every four cups of liquid is just about the right ratio to make a good gravy consistency. I’ve had years where my gravy has been runny and one time I made the mistake of adding more flour directly to the hot gravy. Don’t do this! It makes lumpy, gross gravy. If you find that your gravy isn’t thick enough, get a clean sauce pan and make a new roux – with 2 tablespoons of flour and 2 tablespoons of butter – then whisk the cooked roux into the gravy. That will thicken the gravy and keep it smooth. 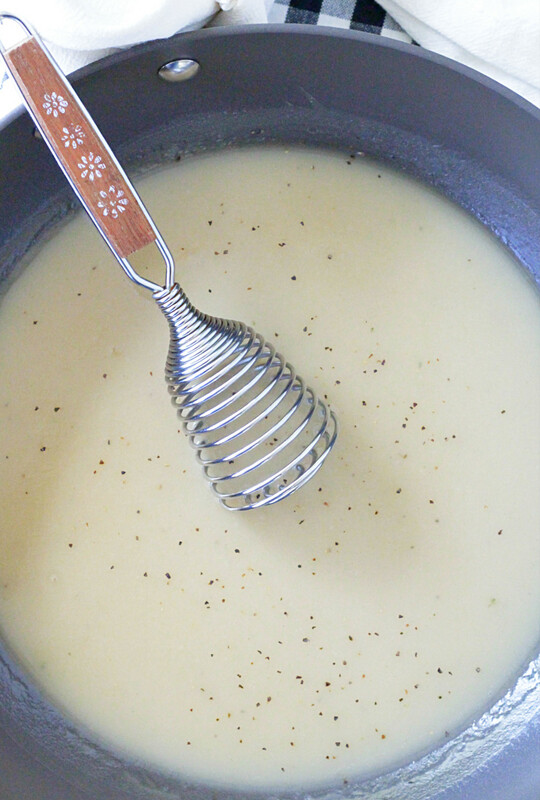 For a smaller amount of gravy, use two cups of broth, three tablespoons of flour and three tablespoons of butter. You can also easily double this recipe if you are feeding a crowd. Roasted turkey drippings are not necessary to make this gravy – just use four cups of canned turkey (or chicken) broth. Adjust the amount of seasonings at the end to flavor the gravy using salt and poultry seasoning (or sage, rosemary or thyme). This is the brand of turkey broth I use for my gravy. I use a fat separator like this one for my roasted turkey drippings. 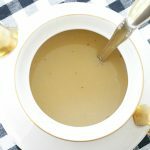 This turkey gravy is my favorite with the turkey drippings from this recipe for roast turkey breast. 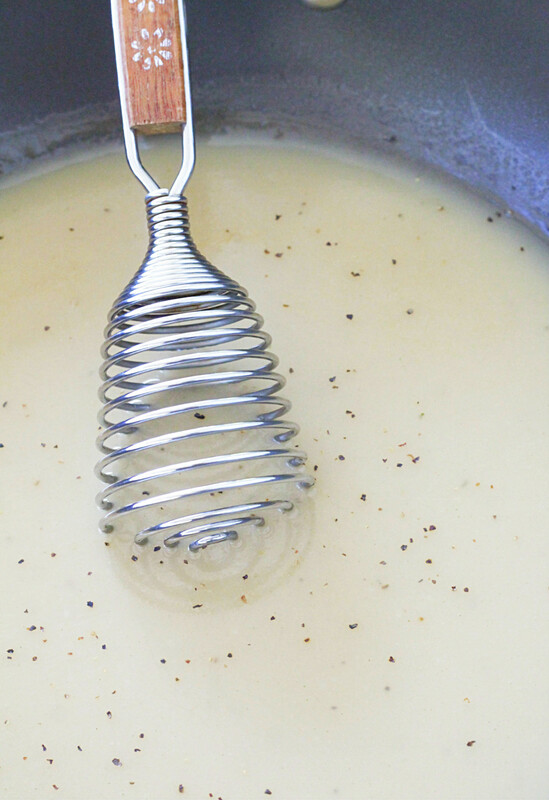 Pour the dripping for your roasted turkey/turkey breast into a fat separator. Allow the fat to rise to the top and pour just the drippings into a 4-cup capacity measuring cup. Add canned turkey (or chicken) broth to the drippings to equal 4 cups of liquid. To a clean sauce pan, add 5 tablespoons of butter and melt over medium heat. Whisk in the flour and cook for 1 - 2 minutes, until the mixture is completely smooth and bubbling and starting to get golden in color. Whisk in the turkey drippings/broth mixture. Bring to a boil and reduce to a simmer. Cook until it reaches the thickness of gravy you prefer. Taste and adjust the seasonings with salt and pepper accordingly. Serve immediately. Anything that starts wtih 5T butter has to be delicious! 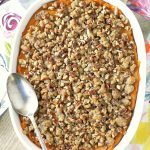 Can’t wait to try your recipe for THanksgiving! Haha, very true! Glad you are planning to try it! I have so many memories making gravy with my mum whenever we had chicken or turkey – it really is so much better than store bought. Memories of cooking with family are the best. Thanks Caroline. 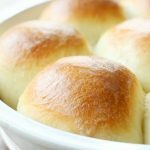 These are great tips and so much better than a jar of store bought gravy! I’m craving Thanksgiving dinner now! Yes, SO much better than a jar (or envelope). Thank you Lauren! 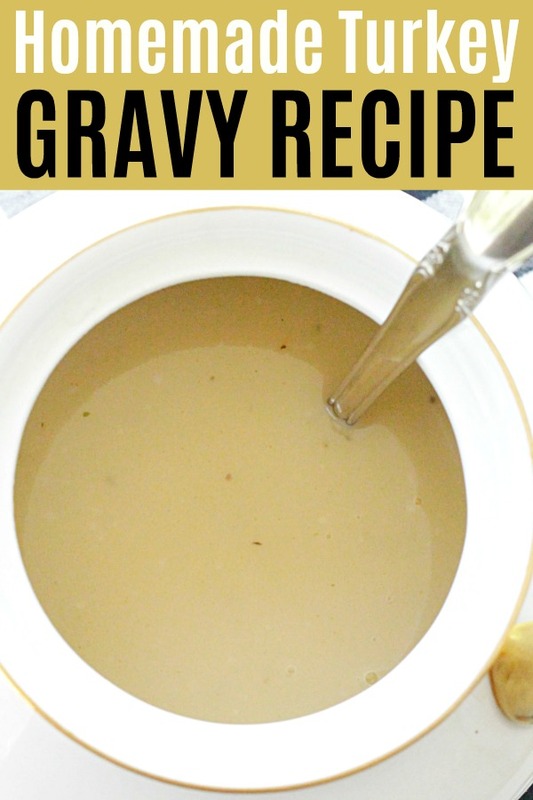 I love that gravy is a side dish at your house! This recipe looks super tasty. I’m always trying new gravy recipes to get ready for the holidays. YUM! 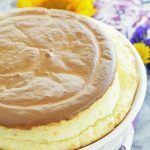 Such an easy peasy recipe with just 4 ingredients. Lovely share and perfect in time. I’m trying to get ahead of the game this year for once – with all my holiday recipes! Don’t you think there would be more flavor if used the Turkey Fat in place of the butter when making the roux? People differ on this. I’ve tried it both ways. The flavor really lives more in the broth that comes from roasting the turkey. My gravy always is a different color depending on the broth I have available. For example, for the photo I used just canned broth. When I make it on Thanksgiving the gravy is much darker because I’ve used the roasted broth that comes from the turkey in the oven.